I’ve been having trouble with getting my posts to the BoardingArea homepage. If you have missed this, consider reading – it will blow your mind! This is TIME SENSITIVE AND THE PRICE WILL GO UP ON THE 29th! Nearly everything is about evaluating the value of miles. This an instance of where it is really important to look for the best redemption. Remember, you can only get the best value from your points only if you know how to use them. I haven’t been around as long as other bloggers, but things I (think) I am good is experimenting with redemptions, maximizing awards, and staying up to date on all information from forums and blogs (*hem* mistake fare :)). I think that domestic first isn’t that worth that much. Frequent Miler presents several options to maximize your miles while flying first class. But I disagree, and I think this might revolutionize “purchasing” domestic first with miles. In my opinion, this is the best and most cost-effective way to fly domestic first class. So either you can spend 34,000 Aeroplan miles, 25,000 United miles, or ~$350. What would you choose? MeliáRewards, a hotel chain with many hotels in Spain and in the Caribbean is selling points with 25% bonus. You can sign up here (I get 250 points per signup to a maximum of a few thousand points – thanks for your support!). This makes every block of 10,000 miles only 64 Euros, or ~$88 Canadian, with each mile only costing 0.88 cents. You can buy miles here. Why is this important? This is because Melia is a 2:1 transfer partner to Miles & More, which allows you to book tickets on Star Alliance Airlines. This means you can essentially buy Miles & More for 1.76 cents each. The cost of each award then, by directly buying miles, is the 1.76 cents per mile multiplied by the award amount. For example, that means a roundtrip award to Europe is just under $2000 if you directly buy the miles, excluding fuel surcharge. But what Miles and More is a great redemption for is using their miles for domestic flights within a single country. Since Canada and US are big countries, this is a HUGE sweet spot (no pun intended). The award price for a one-way is just 17,000 miles. You can annually buy a maximum of 100,000 miles, which transfers to 50,000 Miles & More. his means you can at least get three one-way domestic/transcon business class awards pre year through this method. This means you can fly United Domestic First and Air Canada Executive Class for just $320 plus a maximum of around $50 in airport taxes. This is an AMAZING VALUE. Sure, domestic first class might not be worth paying the premium for. But being able to get the LAX-JFK p.s service with flat beds with connecting flights given that there is space for $320 by purchasing miles and $2.50 in airport taxes is an amazing deal. This is when the flight normally goes for at least $2,000 when buying a revenue ticket. I’m not saying that I would be paying $2000, but at least it means you’re better off using your United miles for transatlantic and transpacific tickets in premium classes. This is nearly exactly the same case in Canada. For example, look at this itinerary which is a one-way flight in Executive Class (Air Canada Domestic Premium Class) which is pricing at just over $2000. This includes the YYZ-YVR in a lie-flat pod (Executive First). The taxes and fees are just $32.60 in addition to purchasing the miles. This isn’t just for the “flagship routes” with a lie-flat bed. This is any route within one country that has exorbitantly high fare prices yet award availability. For example YYC-YEG-YUL which is pricing at over $300 one-way in economy class. 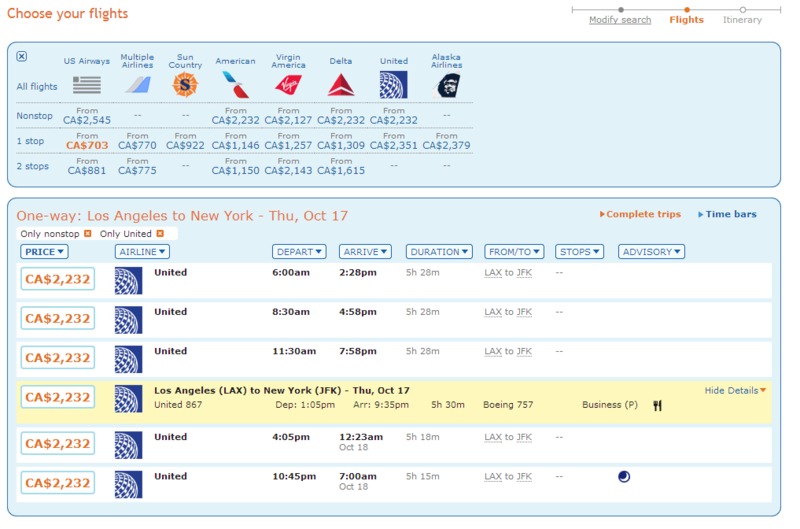 Or even an expensive transcon such as SEA-DEN-MIA which is pricing at over $270 one way in economy class. If there is award space, why not outright buy the miles and get an “upgrade” for under a hundred dollars? Of course the value proposition is slightly different if you have elite status, but it is a fantastic deal to lock in a confirmed domestic first flight months in advance with an award from purchased miles given that the price is this sweet. See what I’m doing here? I’m leveraging three different promotions to achieve the cheapest redemption possible for a flight. When the promotion ends, that means each Mile & More mile will be 2.2 cents, with a 17,000 business one-way domestic ticket pricing at ~$374. Is that a great deal? Still acceptable although not a lot better. But right I think lie-flat seats across the country for under $400 is a definitely a decent if not good deal. I have confirmed that the domestic awards apply in Canada and the US. Does this make your miles useless? No. In nearly all other cases, miles are the best way for international business and first class. But domestic first class is something that I don’t find it is worth spending the money on. So for those who don’t have elite status, this might be a good alternative. 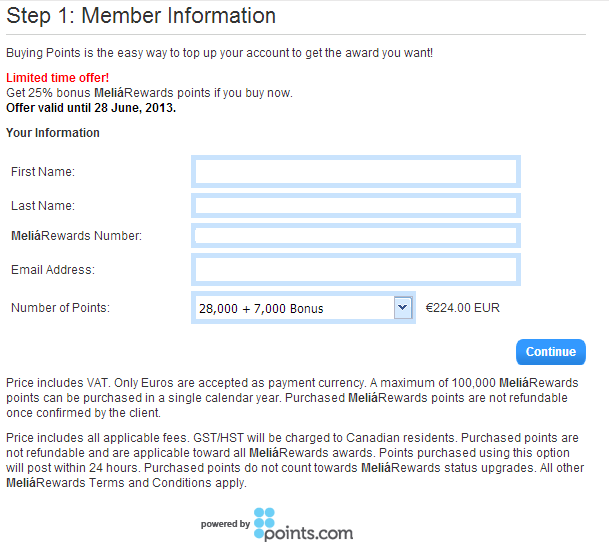 Why sign up with your link if you can earn 2K points by signing up on Melia’s website? You get 2,000 points for signing up through my link too. but you can not find the award on Miles &Smail, can you? Is that possible to get all these processed on-line or you have to call them. Air Canada and United awards with Miles & More have to be booked via the phone call center. And as I know LH charge sq on award ticket, is it true that they do not impose this surcharge on UA and AC awards? Yes, UA and AC does not apply YQ on SQ flights. How much ($) would it be for a round trip domestic in economy? 12,000 miles times 1.76 cents which means around $220 excluding airport taxes. Not as great of a value but worth considering in some cases. Any idea how to check UA award availability online and what the award chart looks like for US48 -> Hawaii? UA Award availability should be the same as the “saver” level on ua.com. You can access the award chart here: http://www.miles-and-more.com/mediapool/pdf/87/media_922287.pdf‎. North America to Hawaii is 20k economy and 35k business, one way. Since UA doesn’t fly 3 class planes from the mainland to Hawaii, would booking a miles and more ticket on UA metal book into 35K biz or whatever higher price F is? I would guess that it books into J as long it is 2-class BusinessFirst, however if United does operate 3-class aircraft then the highest class would book into F. I would check with the call center just to make sure. I only seem to be able to find foreign call center numbers. Would you happen to have it? And last question! Does UA ever actually release saver level transcontinental biz seats? Thanks! The number is 1800-581-6400. Also UA will release lots of space in advance – for example look at LAX-JFK 5/4/14, all 6 non-stop p.s. flights have business class award seats. Congratulations man! First (meaningful) post of your own, no HT, Lucky quotes you, wow! Keep it up! More of your own, less HT and FT 🙂 took you only a couple of months,but I have faith in you. 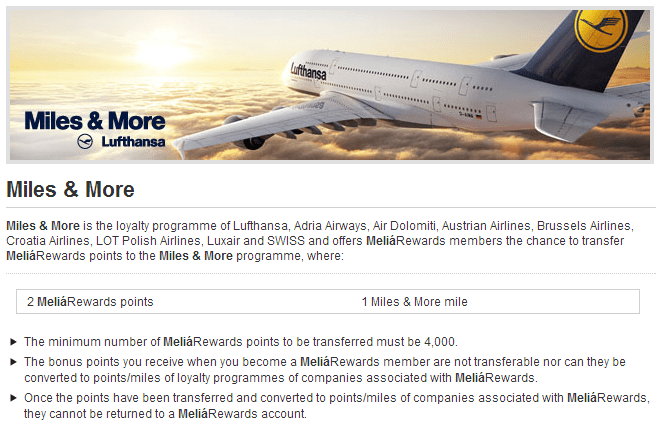 Um, 17k x 3 = 51K…so not quite 3 J flights from a 100K Melia points 2 2:1 conversion (50K). Good find otherwise though! Since you get 2k to start, purchase of the 100k (even without the bonus) would be enough to convert to 51k LH miles. Great post. I have one question. In the LH M&M reward chart, for N. America to N. America, the prices are 30, 55, 75k miles. Is Domestic referring to within Germany only instead of N. America? Just wanted to clarify. Thanks. No, domestic means within one country. I have verified that this works for Canada and the US (travel within Canada would apply at the domestic rates). Other option to consider – Air Berlin has the same exchange rate as LH and is part of One World. However, their redemption chart only has Econ and Bus class. There are some good rates though (don’t think one way is allowed). That chart is for one-way only which makes the prices really high.